An overly excited Sammy the Slug slimes the side of an unsuspecting rock. 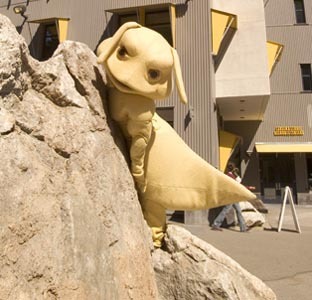 With folks like John Travolta, Jesse Jackson and Michael Moore all sporting UCSC banana slug swag, it's no surprise that Santa Cruz's famous mascot is loved the world over. But what university newcomers sometimes fail to realize is that said slug (proper name Ariolomax Dolichophalus, but friends call him Sammy) is more than just a school mascot with a merchandising fetish. Yes, Sammy is, in fact, a living, breathing flesh-and-blood--actually, make that fur-and-sweat--creature, as native to Santa Cruz as aging surfers, wealthy Realtors and white rastas. So who better to welcome incoming students to the joys of surviving Santa Cruz than our own little hermaphrodite mollusk? In the following pages, Sammy guides us through a gastropodean array of cheap and tasty victuals, packed pubs and clubs, nasty new noise ordinances and, of course, heartfelt romantic advice. So what are you waiting for? Just follow the trail of slime as Sammy and his Metro Santa Cruz pals reveal where all the really good times are right here in Santa Cruz.